Data Storage is one of the crucial needs of any organization. People are looking for easy way to access the data and store it on the voluminous amount. Hadoop is one of the popular options for that, it’s open source software designed for storing data and to run applications. Hadoop is the easy option for those who are looking for massive storage where they can save data, information, and have the ability to do limitless virtual related work without consuming too much time. When to use Hadoop and why to use? 2) It can store as well as easily proves any kind of data in different forms and time period. It can be changed whenever you want. 3) Analyze data and process it fast as compare to any other options. No doubt why Hadoop is on demand, it’s not bad to say that this storage option has everything that people was looking for too long. Apart from that, there are lots of the things to know about Hadoop. 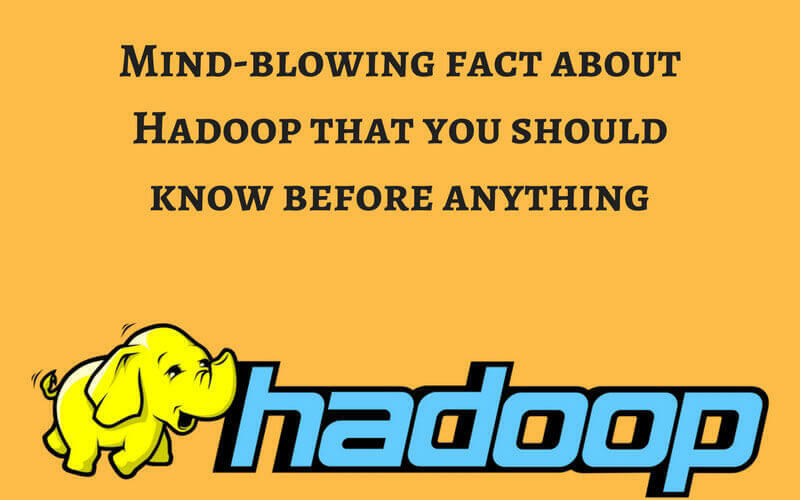 For knowing here are some listed mind-blowing facts about Hadoop that should you know! Data storage system is difficult to understand especially when the size of data is so huge. But not with Hadoop, it has the easy controlling system that can be accessed without creating lots of hassle. Apart from this, Product development is also a crucial part which needs to be maintained. This is important as to affect the future of that product. When it comes to Hadoop, the system regarding environment set up, handling, monitoring, tuning etc. are extremely flexible which makes it easy to control. Also unlike any other database option, Hadoop is best for such use. The whole design of the software is simple and easy. Anyone can understand whatever they wanted. It also allows accessing easily without creating confusion. For any product devilment, debugging is crucial steps as it makes sure to keep the error far away. Debugging is one of those steps which can’t be avoided as it involves analyzing, testing, and monitoring everything. The process is for eliminating the points that can cause an issue for the product in the future. Hadoop had various tools and techniques that help in debugging process easy on a high scale. Also, the software took special care so the process of debugging can be easily performed o different levels and for different events. It also makes sure to keep data safe and secure from any kind of error that helps in upgrading the overall quality of the data at the end. Hadoop have tools like MapReduce, Giraph, Hive, and Pig which are used to analyze data. Hadoop is basically for large volume data, so the analyzing process is much critical. But because of tools and techniques, they can easily do that work without damaging the results. Not just that, such tools also make it more flexible which helps in extending the capability of analyzing. For example, Graph framework is used for solving graph related issues. Also, MapReduce is best for avoiding writing related errors. For any data storage, they require processing all data and information with multiple sheets. Hadoop Big Data Solutions offering various ways to join such sheets, apart from this MapReduce offers two type of joins i.e. Map side and reduce side. Not just MapReduce, other tools also have their own different joins. Such joins are non-trivial and also cost expensive. Pig tool categorized its joins into Merge, Replicated and skewed join. Hive whereas have map side and full outer joins which help in analyzing the data better. These tools also have a special factor as they can combine together which is based on inbuilt features. Hadoop allows to import and export data in the form of HDFS (Hadoop Distributed File System). During the import process, there is one level of processing on the data where one of the tools like MapReduce, hive or Pig. Well, most of the data storage software doesn’t support well when the amount of data is big. It also took time to work properly but not in Hadoop case. Here, the data can be easily processed without getting interaction, not just that it also doesn’t get the effect if the quantity of data is high. It also let the people control the data and complete process. Transferring Data amount data is not just time-consuming but also waste lots of resources. Hadoop allows transferring data easily without taking time, it is also considered as an ideal environment for thing such huge volume of data. Here you will get a process where scalable, reliable and distributed data analyzing and transferring. Also, it avoids any kind of errors that can degrade the quality of the data at the end of the day. For any organization, it’s important to have perfect idea about the data and volume of the information. Not just that, it’s also crucial to meet daily processing task so the work can go smoothly without causing trouble. Sometimes there are so many ways for one task and choosing one solution and implanting it correcting become huge work. That’s why Hive and Pig tools that are used for creating a layer which makes difference data flow and quarries. On another side, MapReduce is for marinating the flow in work. Hive is for form analytics and Pig for writing. Overall, the main focus of Hadoop is to make the data work smooth.